Ibrox Noise: How do Rangers plan for next season? How do Rangers plan for next season? With the optimism that had understandably coursed through the veins of Rangers fans over the past month or so, Friday’s shuddering and inexplicable loss at the hands of Falkirk came as something of a crude bump. The majority of the play on display from Mark Warburton’s men had been slick, incisive, flowing, and cohesive, and only bizarre sloppiness and arguable complacency later in the game cost all three points. It has certainly provided food for thought regarding the quality of the squad in light of promotion to the Premiership, and has raised questions as to exactly what requires enhancing come this summer. It is well on record that Warburton and chairman Dave King do not intend a mass cull or exodus, famously stating that they wanted players last summer and January who would be ready-built for promotion to Scotland’s top tier, preventing Rangers having to rip it up and start again come summer 2016. Warburton has already secured Accrington Stanley pair Josh Windass and Matt Crooks, who look set to be heavily involved in the first team next season – Crooks certainly fills the glaring hole that is defensive midfield, and Windass will provide further creativity just behind the attacking trident, or indeed will play there, depending on Warbs’ preferences. However, what else needs resolved? Evidently Rangers are embarrassed with riches up front. The attacking quality consists of Harry Forrester (if his deal is extended), Barrie McKay, Martyn Waghorn, Kenny Miller, Michael O’Halloran, and aforementioned Windass, with Nicky Clark and David Templeton in reserve, if both remain (admittedly unlikely). Surely no more attackers are required beyond perhaps one more pure goalscorer? And midfield sees no lack of personnel either; Andy Halliday, Dominic Ball (if he remains beyond the expiration of his loan), Gedion Zelalem (although he has struggled after a bright opening, and again his loan ends this June), Jason Holt, Nicky Law, Dean Shiels, Matt Crooks and potentially Josh Windass again provide a fair chunk of depth here, even if the quality is not absolutely marquee throughout. This area looks fairly busy as well but Warburton will probably have an eye on one or two signings here. The question of defence is the one on most fans’ lips after three calamities at the back saw Warbs’ side effectively gift the Bairns the win last weekend. While James Tavernier and Lee Wallace have been impressive in attack and in providing width, there have been a few questions over their defensive positionings now and then, with more than once seeing either caught off-guard after another foray forward. However, against better quality Warbs will surely make them curb those attacking instincts when need be in favour of protecting the backline more consistently. 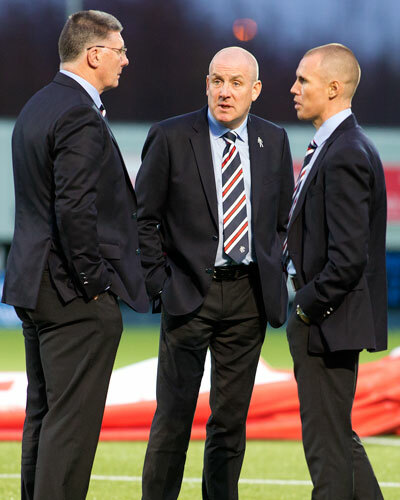 The central partnership and the guts of Rangers are where arguably most problems seem to lie. Doubts remain over Danny Wilson, Rob Kiernan and Dominic Ball’s abilities against better sides on a consistent basis – all three were outstanding against Dundee, but a bit of a liability v Peter Houston’s men. The connection here to holding midfield is also an issue – there sometimes appears to be a huge gap between both sets of players, with distance between central defence and central midfield a bit too lengthy, and this opens up the defence like a hot knife through butter. Whether this requires coaching of the existing players to adapt better or the blunt addition of better ones remains to be seen. Naturally Mark Warburton knows far better than any of us supporters what his squad needs, and where it excels. He is the one, along with Sir Davie of Weir, who works with them daily and knows them inside out. He will know what is needed, and here is hoping he is supported to obtain the resources he needs, if any, to launch a worthwhile assault on the Premiership next season. we need a centre back with a bit of steel we are to easily bullied at the moment,i would like someone in the mould of kevin Nolan if available,murray Davidson or callum Patterson. Cannot believe you include Lee Wallace in your discussion over the defence. His strengths outweigh any weaknesses you suggest in his flamboyance but for me he is first pick. Great player and Captain and the one who has stuck with the club through thick and thin wearing his heart on his sleeve. Hope he leads us for years to come! I think another striker (false nine), central defender (possibily Ball) and right-back are at least required. The RB doesn't have to replace Tav, but should give him some competition. I think he lacks it now and gets a bit complacent. The following will leave: Zelalem, Law, Shiels, Templeton, Clark. I can see Ball returning on loan next season as his chances at Tottenham will be limited. We should expect another player on loan from them with the creative midfielder Harry Winks mentioned already. An out and out striker should be on the cards, but Hardie might have done enough to push himself forward for this role. Cummings from Hibs - I hope not as this will only lead to more haggling with a club that just don't want to sell to us. A good quality centre back with an abundance of pace is a must to counter the attacking tendencies of Tav and Waldo. I would not want to change their style as I think this is the way to beat teams. Basically score more than they do. So, 2 or 3 quality signings backed up by the current crop of outstanding youth players will do for me. Srengthen again in January 2017 for the run in depending on where we are challenging. Need strength in depth in defence (all positions) and centre mid. We've been lucky to be able to play pretty much same back four all season with virtually no injuries - if we get two of our back four injured next season (which happens to most teams at some point) who comes in....??? Centre mid, I'd have liked Diagouraga. We need a big, scary dominator who will support the centre halves. "B" it "T" hick again,why dont you sling your hook! This i repeat again, is a site for rangers people. We dont care for your input,so go away back to Porkhead or Fester road. Anonymous by name, anonymous by nature. Who do you speak for when you say "we" don't care for my input. You run this site do you? In my opinion McGinn, who is related to Jack McGinn, he of the child abuse cover up, should never be allowed to sully our club. Kiernan has been one of our best players, and Ball has been excellent. I don't know what game you are watching or where oyu are getting those spurious stats. Both are over 6ft and good in the air. I would say we need cover at right bck shay login is a free agent in summer or hibs david gray wud b gd cover n same at left bck pos greame shinnie who cud play in the front 3 aswell. 2 centre bcks for starting 11 n wilson n kiernan will b cover. Cummings of hibs for the striker cover has an eye for the goal and can score from anywer. Also been watchin the boy stewart of dundee recently that boy is a dynamo non stop always involved in everyfin gd dundee do gt an eye for goal him n holt cud b rotated to keep us hungry n fresh every min of every game in that attackin mid role. I hope forrester gets a contract the boys done good! !